Work shirts that keep you warm and look good too. Made tough. Ely had a flannel lined denim shir, lined like this one, but it has been discontinued. Sometimes when one door closes. another opens. This warm shirt is a great addition to any wardrobe. Whether backyard fun & grillin, or raking those leaves for the kids to jump in, stay warm, and respectable! Made with features that let you move with ease while you work. 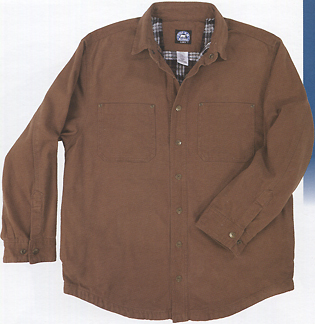 Reinforced and a lining that makes this Ranch work shirt a great choice for much of the year. Wear it more open, to keep the chill off your back, or close it up for those colder days. 100% cotton 10oz duck outer shell. Brushed hand for a comfortable feel as you move. Washed finish. Flannel lining. Side seam hand warmer pockets. Black taffeta sleeve linings. Snap front closure. Two exterior chest pockets with sewn down pencil stall. Easy on / easy off!